(a trading name of Sun Air Express) is a United States airline with its headquarters in Dania Beach, Florida in Greater Miami (the headquarters has a Fort Lauderdale mailing address). It operates charter services as well as scheduled passenger services subsidized under the Essential Air Service (EAS) program. The airline began subsidized scheduled service to Victoria Regional Airport from George Bush Intercontinental Airport in Houston, Texas on October 1, 2012. 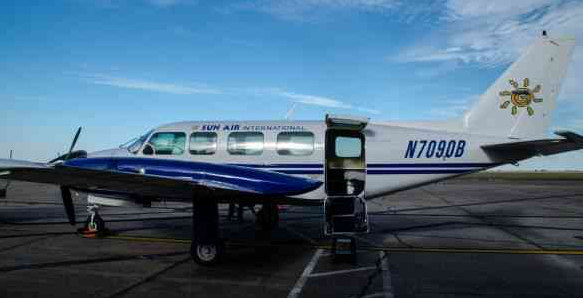 A little over a month later Sun Air began service from Washington Dulles International Airport to Lancaster Airport (Pennsylvania) and Hagerstown Regional Airport in Maryland. Sun Air had planned to begin service between Atlanta and Middle Georgia Regional Airport in Macon, Georgia on December 1, 2012. However, the airline decided to pull out of the airport deal. Sun Air International's passenger bookings are handled by Pacific Wings and their flight listings in travel reservation systems are under Pacific Wings' IATA code, LW.